Beautifully situated in the Chittoor district of Andhra Pradesh, Tirupati is one of the richest and revered pilgrimage destinations in India and across the world. Tirupati is renowned for Lord Venkateswara Swami temple and visited by thousands of devotees every day. This special Tirupati package of 2 nights and 3 days will take you through Tirupati as well as other significant temples in the region like, Govindrajaswamy temple, Tiruchanur temple, Kapil Theerthram. So, book this package now and get indulge in the purity and bliss. Located at a distance of 1.5 KM from Tirupati Main Railway Station, it is one of the most popular 3 star properties in the town. The hotel features 38 well-furnished roomes befitted with all modern facilities and amenities. Apart from providing comfortable stay, it also offers other facilities such as Swimming Pool, Banquet Space, In-house restaurant etc. Meet our representative on arrival at Chennai Airport who will further transfer you to Tirupati (by car). You may also pay an en-route visit to the famous Sri Kalahasti Temple (one of the most revered Shiva temples in South India). After reaching at Tirupati, check in at the pre-booked hotel for overnight stay. Pay an early morning visit to Tirupati Temple (for seegra Darshan). 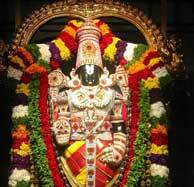 After darshan of Lord Balaji, proceed for visits to other significant temples like Tiruchanur temple, Sri Kalyana Venkateswaraswami temple (at Srinivasa Mangapuram), Kapil Theertham etc. Come back to the hotel for dinner (on direct payment basis) and comfortable night stay. After having leisurely breakfast, you will be transferred to Chennai airport to board flight back home or to onward destinations.